The police, on Tuesday, arrested four persons from Makli village in Goaltore in Jungle Mahal in West Midnapur, claiming that the arrested persons were instigating villagers to join the Maoists. However, no evidences of the claim has been found so far and the arrests raise concerns that the cases are politically motivated. A Groundxero report. The police, on Tuesday, arrested four persons from Makli village in Goaltore in Jungle Mahal in West Midnapur district of West Bengal. Among the arrested four, two are students from Kolkata. The police claimed that the arrested persons were instigating villagers to join the Maoists. The four arrested are Sabyasachi Goswami (aged 50 yrs), Sanjib Mazumdar (aged 24 yrs), Arkadip Goswami (aged 23 yrs) and Mustafa Kamal (aged 23 yrs). While Arka is a fourth year student of Burdwan Medical College, Tipu is a student of Sanskrit College, Kolkata. 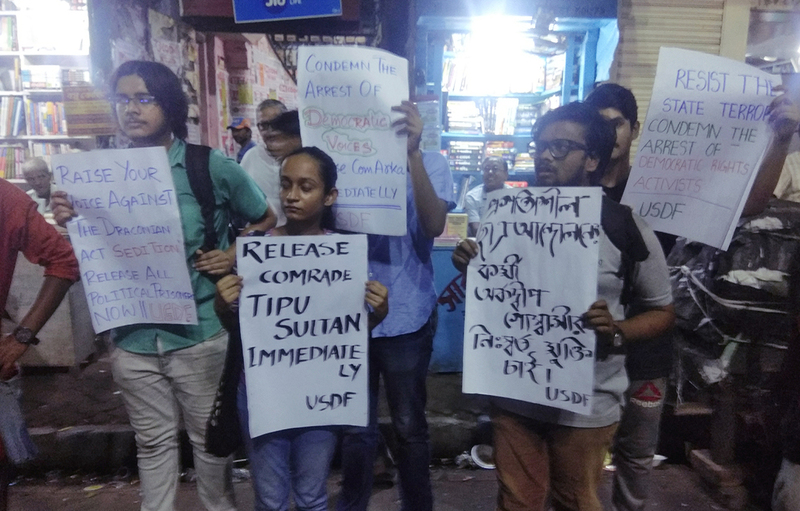 Both Arka and Tipu are members of a leftist student organization USDF, while Sanjib is associated with Committee for Release of Political Prisoners (CRPP) and Sabyasachi who had been arrested earlier for alleged links with CPI (Maoist) is on bail granted by Calcutta High Court recently. All the four were known faces involved in legal and democratic political and social activities. 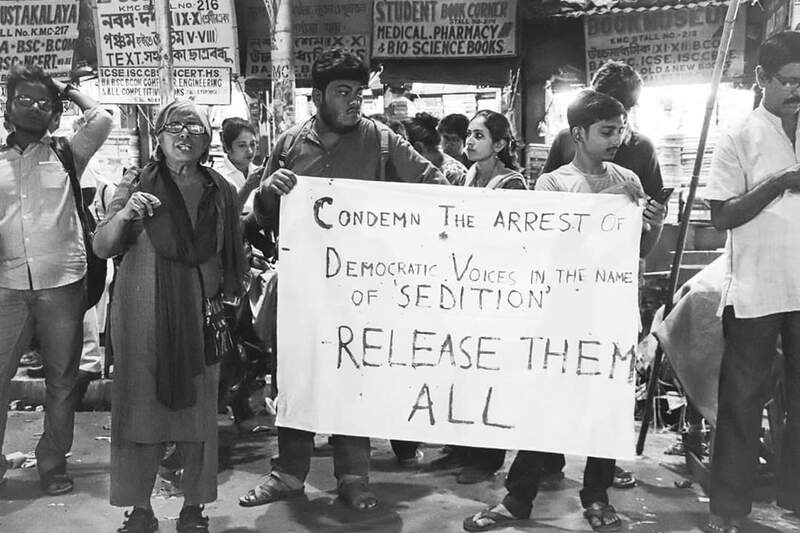 The police have imposed serious charges on arrested activists and booked them under IPC section 121 (waging war against the state), 121A (conspiracy to commit offence against the state), 124A( sedition) and 120B (criminal conspiracy). On Wednesday, the police produced them in court which granted 14 days police custody to all the four accused. Police sources alleged that Maoists are trying to take advantage of the people’s ‘resentment’ against the ruling party and regroup in the area. The police claimed before the media to have found ‘Maoist Literature’ from the arrested persons and hence justified its action. 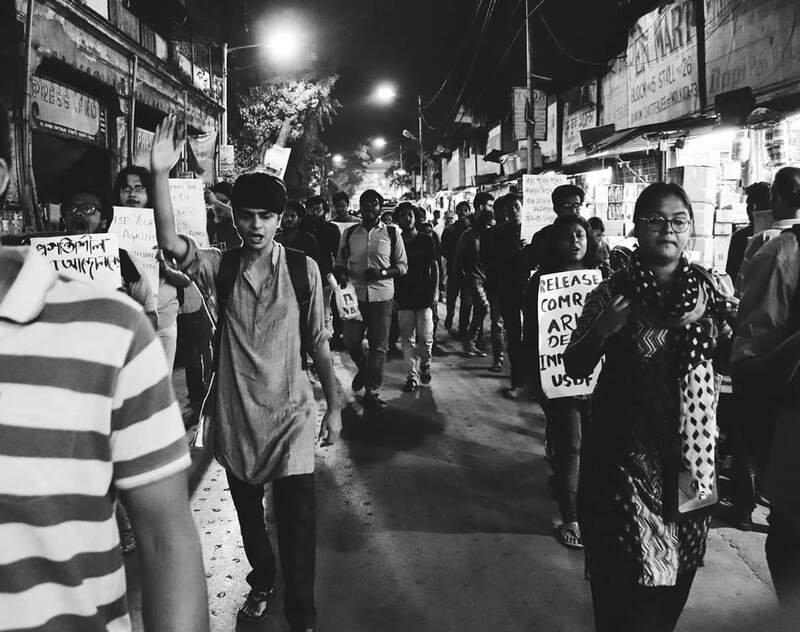 Yesterday, various student organizations, human right organizations and activists gathered in front of College Street Coffee House and took out a rally condemning the police arrest of the political activists. 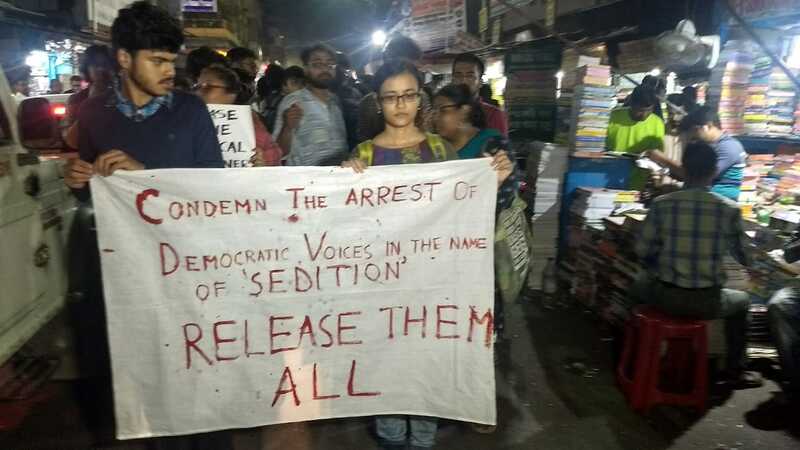 The participants criticized the police move to charge the arrested persons under Sedition and accusing them of ‘waging war against the State’ as a sinister attempt to silence not only the voice of dissent but a dangerous ploy to thwart democratic right of a citizen to move freely within the state. The police claim of finding ‘Maoist literature’ from the arrested persons to justify the arrest is not only ludicrous but also reminds us of the similar claim of the police during the previous Left Front government regime. The members of USDF claimed that the arrested persons had gone to Goaltore to conduct survey on the living conditions of the tribals and the reason behind the BJP’s ‘rise’ in West Midnapur. Also it is beyond anybody’s imagination as to how they would ‘wage war against the Indian State’ when the only thing the police itself claimed to have found in their possession was ‘Maoists literature’ and nothing else. It needs to be noted that the Indian courts have on many occasions clearly stated that the mere possession of certain literature cannot be considered a crime. In April 2011, the Supreme Court observed while granting bail to Binayak Sen that “the mere possession of Naxalite literature does not make a person a Naxalite”. The test consistently applied by the higher judiciary is of the one laid down under Article 19 of the Constitution, which protects the rights to freedom of speech and expression, to assemble peaceably and without arms, and to form associations or unions. Article 19(2) empowers Parliament to impose, by law, reasonable restrictions on these rights in the interests of sovereignty and integrity of the country and provisions such as Sec 124A of the IPC and Sec 20 of the UAP Act have been construed as reasonable restrictions. The higher judiciary has held that the interpretation and application of these stern provisions must be in consonance with constitutional values and principles, and the concept of “membership” ought to be read in the light of freedoms and rights. Hence, “membership” of a banned outfit has to be active — not passive — to attract penal provisions. In a democracy, the government must live up to its responsibility to respect human rights guaranteed by the constitution in any action it takes in the name of security. In the light of the above judgements, the nature of these arrests and the evidence put forward by the West Bengal police raises concerns that the cases are politically motivated. The recent death of seven persons from Sabor community in Lalgarh along with these arrests has once again brought Jungle Mahal in political limelight and has exposed the hollowness of the Chief Ministers claim of ‘development’ and that her government has brought ‘smile’ to the face of the tribal’s in Jungle Mahal. To deflect public attention from the deaths of the Sabor’s, it is her government’s response to expression of political beliefs and peaceful dissent with imposition of dubious criminal cases on political activists.